Sometimes, a chick has to let her hair down. What better way to have fun than to take in a burlesque show. So, Thursday night I headed over to the Bowery Poetry Club to hoot 'n' holler and have a good time at the NY Pin Up Club's monthly get together. The show was hosted by the groups leader, the loveable Brandon Herman and with co-hosting duties handled by the adorable saucy, delectable diva Miss Em. The lovely Desiree DeLovely belted out "At Last" which you can see if you scroll down to the bottom. That tiny little lady has a big voice! It was her first official performance for the group; unofficially, she emerged from the audience a couple of months ago and blew us away. She was great fun to watch and looked to be having a blast onstage. 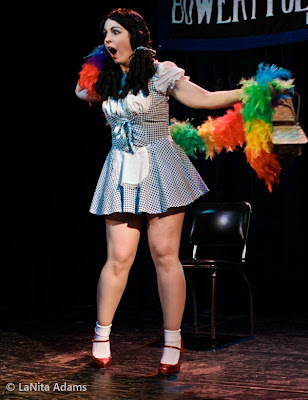 She also made an adorable Dorothy as you can see in the photo below. Everyone should have a pair of ruby red pumps. Red hot, redhead Cherry La Voix from Ohio also sang and has a great voice as well. Why oh why didn't I turn on my video to catch one of her songs? The two songs she sang were her own compositions. I forgot to ask her if she has any recordings available, shame on me! It was my first time seeing her perform and it was definitely a treat. She makes a really good bad girl as you can see below. Miss dynamite, Iris Ex Plosion didn't sing but she put on one hell of a show! I'm sure a lot of the gentleman in the audience have a new found fondness for marshmallows now. I certainly won't look at them the same way again. You should have been there! Like her fellow performers, she was great fun to watch. The photo below was just the beginning! 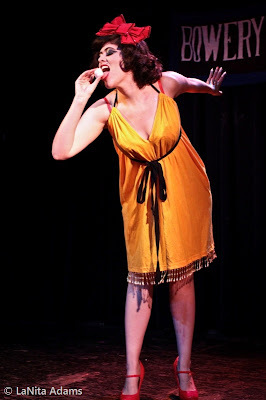 I know you were probably expecting some risqué photos since this was after all a burlesque show. But, if you want to see that, you've got to go to the shows! The first Thursday of every month is always entertaining!